It does not matter where on Earth we are, water is essential for all living organisms. Some organisms are luck and do not even have to consider that as a problem but for the others it means a daily fight for survival. Desert is a typical example where water sources are rare, sometimes it does not rain even for years. But water is not just a transparent liquid, it can also be vapour or solid ice. In today’s article I will focus on collecting liquid water from water vapour. This is called water condensation and you might be surprised what kind of solutions nature has developed for that. Nature has two different options to make use of chemical and physical properties of water. It does it through material properties and structural variations. The Namib beetle’s back with bumps, spider silk with periodic spindle-knots and joints, and cacti with conical spines are good examples of collecting water from fog. They use different strategies to condense water with unusual structural features at micro- and nanometer scale controlling their interaction with water and hence wettability. The Namib beetle has a matrix of combined hydrophobic and hydrophilic surfaces on its back which attract water molecules and enable constant flow-off to its mouth [1, 2] simply by lifting its bottom higher than its head. Approximately 0.5 mm big bumps  are not covered with wax, therefore are they hydrophilic and serve as water condensing points. The rest of the surrounding area has a waxy coating which makes it superhydrophobic. As the water droplets get bigger, they are effected by gravity and start to fall towards waxy parts from where they are channelled away, directly to the mouth. 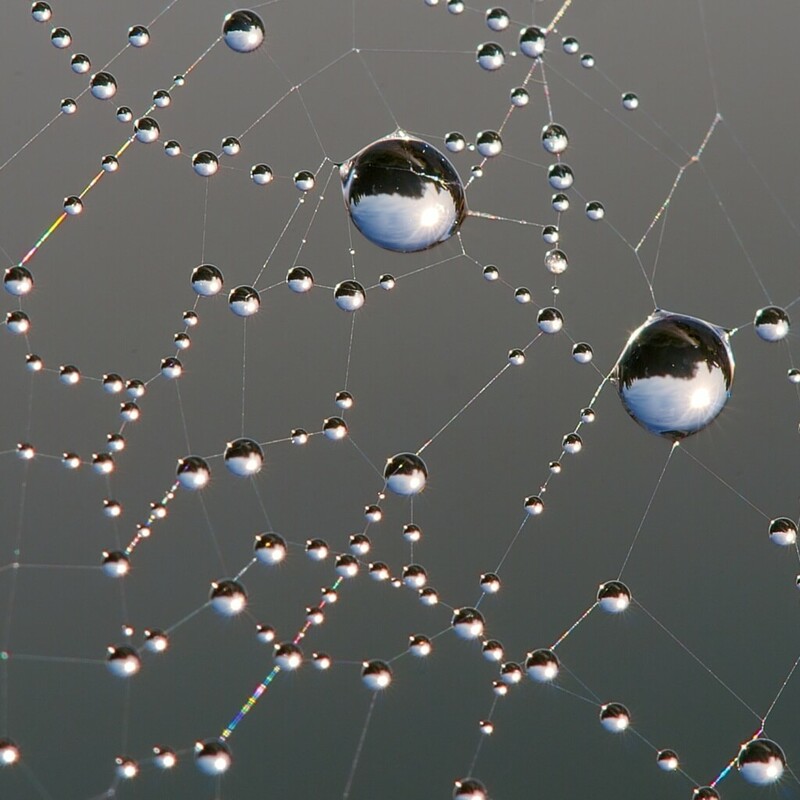 When spider silk is placed in fog, its structure changes as water starts to condense and forms drops that move along the silk fibre. At the initial stage, tiny water drops condense on semitransparent puffs (Figure 1 A, B) and as water condensation continues, the puffs shrink into opaque bumps and finally form periodic spindle-knots . Some cacti (e.g. Opuntia microdasys) have a unique water-collecting systems, composed of well-distributed clusters of conical spines and trichomes on the stem (Figure 2). The spines are composed of three parts with different structural features – the tip contains oriented barbs, the middle contains oriented grooves and the base contains belt-structured trichomes . The advantage of such water collecting system in cacti is that they can absorb water all over their surface without being forced to channel it to the roots. with r being the surface roughness, θw and θ the apparent (outer) and intrinsic (inner) contact angles on rough and smooth surfaces, respectively. The chemical composition of spider silk does not change much along the fibre but joints of spider silk have a smaller axial-parallel roughness and hence larger water contact angle than the spindle-knot (Figure 1 A). That is, the spindle-knot is more hydrophilic and has a higher apparent surface energy than the joint. In the cactus, the tip is covered with wax and is therefore more hydrophobic, whereas the base is less rough and less hydrophobic. 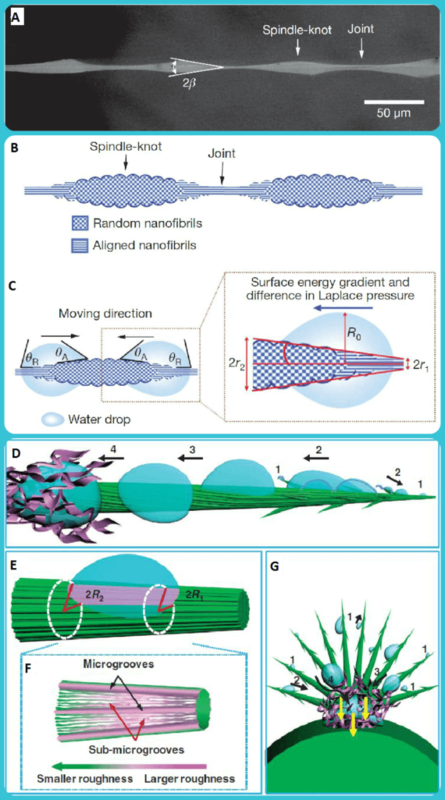 The surface energy gradient (Figure 1 C, D, F) arising from differences in roughness thus drive water drops to move from less hydrophilic regions (joints and spine tips with relative lower surface energy) to the more hydrophilic regions (spindle-knots and spine bases with high surface energy). The second driving force for directional water drop movement arises from the conical shape of the knots and spines, generating a difference in Laplace pressure. The Laplace pressure on high curvature site (r1) is larger than that on the low curvature site (r2) because r1 is smaller than r2. The resultant non-equilibrium Laplace pressure propels the drop to move from the joint to the spindle-knot (in spider silk, Figure 1 C) and from the tip to the base side along the cactus spine (Figure 1 D-G). The overall result is that the surface energy gradient and Laplace pressure gradient act cooperatively to drive condensing and growing water drops from the joint to spindle-knot . In cacti, conical barbs, grooves and trichomes serve for water collection (Figure 2 a-c). Deposition initially occurs on the barbs with the water drops moving directionally along them. As the deposition proceeds and the water drops coalesce, these drops increase in size. 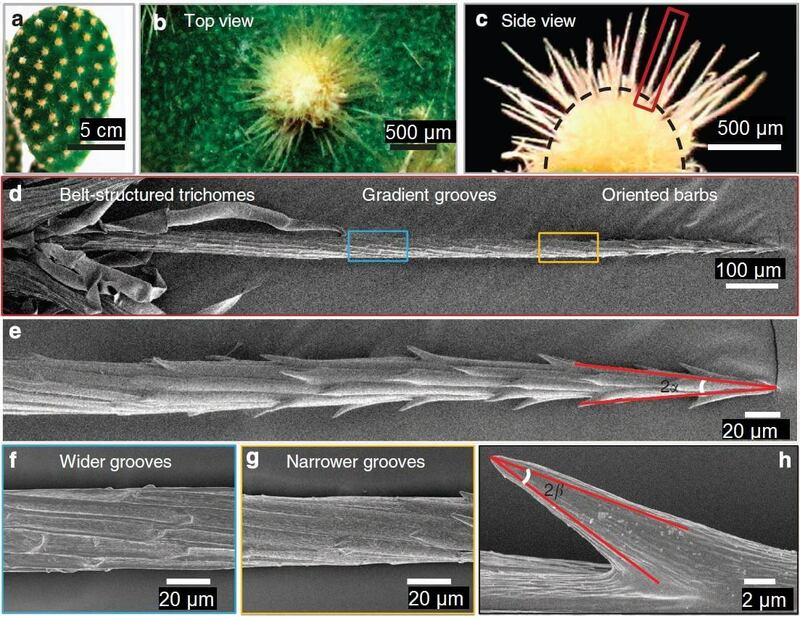 They are transported along the gradient grooves and absorbed through the trichomes at the base of the spines (Figure 2 d) . 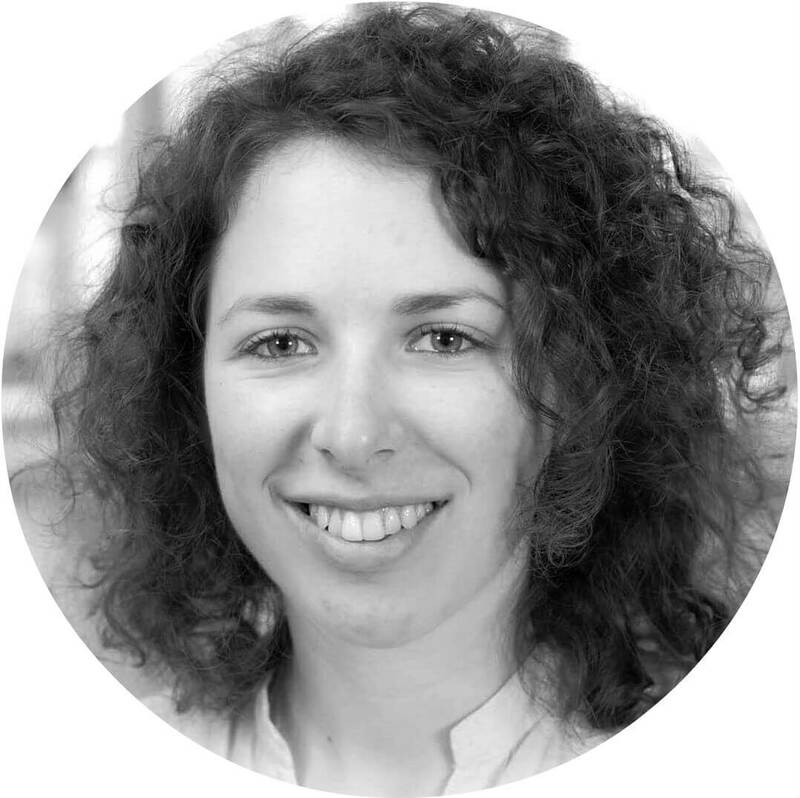 From my point of view, the most interesting thing in Biomimetics is to describe properties of plants or animals in a form of chemical and physical laws leading to engineering approaches. Accordingly to the topic of water condensation and collection there have already been many projects and applications proposed, but with modern technology (e.g. 3D-printers) I am sure ideas can even evolve further. Actually, I am very interested, if you already have an idea. Do you?